One of the principal requirements in ultrasonic systems for non-destructive evaluation and medical diagnostics is a high lateral (frontal) resolution throughout a large depth of field. This requirement can be met if the piezoelectric transducer (transmitter-receiver) used in the system forms a narrow weakly diverging ultrasonic beam within a large axial range (collimated beam). Many papers, books and patents have addressed this problem due to significant practical benefits that are offered by ultrasonic systems capable of producing collimated beams. Several types of piezo-transducers have been designed to address the need for high lateral resolution. The most commonly used approach is to employ a focusing transducer forming a narrow ultrasonic beam in its focal spot. However, the major disadvantage of this design is that the beam widens before and after the focal spot. The focusing in such a transducer is provided either by the shape of the piezoelement or by a spherically focusing acoustic lens. The application of different shape lenses allows the creation of a transducer with a stretched focal zone [1-3]. Some improvement in lateral resolution can be achieved by using the multi-pointed star-shaped electrodes [4, 5], acoustic zone plates, zone lenses, stepped lenses or annular transducers [4, 6]. In recent years the transducers creating so-called "Bessel beams" or "limited diffraction beams" have been extensively studied [7-10]. Such non-uniformly excited (apodized) piezoelements give a line focus with depth independent beam-width out to a certain depth. A somewhat different design of non-uniformly excited piezo-transducers that can form a specified directivity pattern (e.g. with a narrow main lobe and low level side lobes) has also been developed [11-14]. At present time, multi-element transducers (phased arrays) provide the best results in acoustic field focusing throughout a large depth of field. In such arrays, each piezoelement (in transmission mode) is excited by a uniform electric field of specific amplitude and phase independently of all other elements. As a result, different elements radiate different acoustic signals. With the proper choice of exciting electric signals, the interference of the emitted ultrasonic waves will generate a narrow main lobe and low level side lobes in the directivity function. However, such transducers need fairly complex electronic circuitry, have low energy efficiency and low lateral elevation resolution (for linear phased arrays), are large in size and fairly expensive. Naturally, each type of transducer design mentioned above has its advantages and disadvantages. This paper presents an analysis of two issues: a) non-uniformly excited (apodized) single element transducers and b) lenses with "logarithmic" profile. The former are capable of creating a specified acoustic field and are probably the most promising in providing good lateral resolution over a large depth of field. At the same time, they are relatively simple, inexpensive and can be manufactured in a variety of sizes and frequencies to match the application. The latter offer the simplest and least expensive route to obtain a stretched focal zone with fairly high lateral resolution and energy efficiency. We will first consider the problem of determining pressure distribution on the surface of piston transducer needed to generate a specified far zone directivity pattern. This approach is partially described in [11-13]. In general form, the problem of designing a transmitter according to a specified directivity function has been rigorously solved and carefully examined in radar technique . We will apply a similar approach to a piezoelectric transducer. In short, this involves determining the desired pressure distribution on the surface of a transmitter, which will generate the specified directivity pattern. where r and j are the polar coordinates of the radiation point, k = 2p/l is the wave-number, l is the wave-length, is the distance between transmission and observation points, and w is the angular frequency. where J0 is the Bessel function of the first kind and zero order. Now the problem can be formulated as follows. One should determine from (3) the required pressure distribution P(r) on the piezoelement working surface, which will produce an acoustic field described by the specified or desired directivity pattern (function) D(q). Mathematically it means that we have to solve integral equation (3), which is a Fredholm integral equation of the first kind. where J1 is a Bessel function of the first kind and first order, an is the n th root of equation, J0(a) = 0, i.e., a1=2.4, a2=5.5, a3=8.6 etc. where N is a normalizing factor. Expand the specified directivity function D(q) into a finite series (5) using several first terms of the expansion and compute the corresponding coefficients An making sure that sum of the selected terms represents D(q) with reasonable accuracy. Calculate pressure distribution P(r) using formula (4) with coefficients An determined in step one. Both calculation steps can be performed numerically. As a result, we will obtain an approximate solution to the synthesis problem of the axi-symmetric piston piezo-transducer, this problem is constrained by far zone directional pattern of the transducer. Since expressions in the right-hand side of (5) do not form an orthogonal set of functions, it is impossible to find the coefficients An by using the standard method and integrating the products of these functions by D(q). However, it can be done numerically, taking into account that series (5) is a convergent one. The last assertion can be easily proved applying two theorems: The Weierstrass M-test for uniform convergence for series of functions and the ratio test for convergence for series of numbers. As a result, any twofold differentiable bounded and continuous function or polynomial can be expanded into series (5) and the coefficients of expansion can be determined. Naturally, the question arises whether any directivity function can be expanded into the series (5). From the Weierstrass theorem it follows that any function continuous in a limited interval, can always be matched with such a polynomial that its deviation from the function in this interval is arbitrarily small. This polynomial, in turn, can be approximated to any degree of accuracy by a finite number of terms per equation (5). In applying the obtained approach to the design of a transducer with a narrow main lobe and small side lobes in the directivity pattern (i.e. a transducer forming narrow weakly diverging ultrasonic beam) one should consider results well known in radar applications. By adding up a large number of terms in (5), one can, in principle, achieve an extremely narrow main lobe and almost no lateral lobes in D(q). However, in this case, series (4) will contain the same large number of terms and, consequently, the desired P(r) will vary sharply in amplitude and phase across the surface of the piezoelement. Mathematically, it means that series (4) and (5) become weakly converging and contain many terms. Physically, it leads to the following conclusion: in order to obtain directivity pattern looking like d-function (i.e. to create a super-directional transmitter) the pressure distribution in its aperture has to be a high-frequency sharply oscillating function with enormous amplitudes and must be realized with a high degree of accuracy. Practical implementation of such a pressure distribution on the working surface of a piezoelectric transducer is not currently possible. Therefore, a compromise solution should be utilized to get a simplified approach. The method described below was implemented numerically using MATLAB software. Criterion (6) increases when side lobes decrease and main lobe becomes narrower, because the denominator in (6) decreases. At the same time, (6) increases when the main lobe amplitude, the numerator in (6), increases. Secondly, we computed a few sets of coefficients An based on the requirement to obtain maximum Q. Thirdly, we calculated the pressure distribution P(r) using equation (4). Fig. 1 shows the computed normalized directivity patterns |D(q)| in transmission mode obtained using five terms (curve a) and twelve terms (curve b) from (5), with coefficients An maximizing criterion Q. The related normalized pressure distributions P(r) on the piston surface calculated by formula (4) with the same coefficients An are shown in Fig. 2. For comparison, in Fig. 1 (curve c) we showed the normalized directivity function in transmission mode for an ordinary piston transducer. Fig 1: Normalized directivity patterns |D(q)| in transmission mode calculated by formula (5) with five (a) and twelve (b) terms, respectively, with coefficients An maximizing criterion Q. Curve c is pattern for ordinary piston. Stars are experimental results. For all cases piezoelement diameter 20mm, frequency 5MHz. Fig 2: Normalized pressure distributions P(r) on transducer surface calculated by formula (4) with five (a) and twelve (b) terms respectively. For both cases piezoelement diameter 20mm, frequency 5MHz. As one can see from Figs. 1 and 2, the described algorithm allows the design of piston transducers creating narrow weakly diverging ultrasonic beams. Furthermore, the narrower the desired directivity function is, the more complex the corresponding pressure distribution on the transducer surface becomes. Ordinary circular piston transducer, when only the first term in (4) and (5) is retained. Annular transmitter (ring transducer) obtained by subtracting the results for two disks of different radii. Bessel beam (limited diffraction beam) transducer [7-9, 18], if only one n th term in series (4) and (5) is retained. To design a transducer that can generate a narrow weakly diverging ultrasonic beam and has an oscillating pressure distribution on the surface, it is possible to use three different approaches [7, 8, 19]. First, one can assemble the multi-element transducer composed of several annular piezoelements [8, 19] and then apply excitation voltages with opposite polarities and different amplitudes to drive each one of them. This method actually produces an annular phased array with all its merits and drawbacks. The second approach involves the use of non-uniform poling [7, 19] to realize the desired oscillating pressure distribution. This process will produce a simple one-element probe; however, the polarization procedure is fairly complex, and may be difficult to control to assure consistency. The third approach, which was implemented in the present research, relies on depositing several pairs of concentric ring electrodes of specific size on both surfaces of an ordinary piston piezoelement . Each pair of electrodes (two concentric rings of the same mean diameter but different widths located on the opposite surfaces of disk) was excited in opposite phase to the neighboring ring-pairs and with different amplitudes. We designed and manufactured a 5-ring transducer with an oscillating pressure distribution on its working surface capable of generating a narrow weakly diverging ultrasonic beam. Five ring electrodes were etched on each face of a piezoelectric disk (resonant frequency 5MHz, diameter 20mm). It was the maximum number of electrodes we managed to make on this piezo-disk. The mean diameters of both electrodes in pair were equal, but one electrode was wider than the other. Front and back electrode diameters for each pair of electrodes were selected to provide the exciting electric field distribution (and, correspondingly, the pressure distribution on transducer surface) that approximates the function shown in Fig. 2 (curve a). The details of the technique were discussed at length in [11, 19]. The transducer was driven in transmission mode by short pulses (15ns) from ultrasonic pulser-receiver UTEX UT-340. Electrode pairs were excited through capacitor dividers designed to match as closely as possible the amplitude, phase, and shape of the exciting electric field and acoustic pressure on the piston surface. The piezoelement with five pairs of ring electrodes and corresponding driving voltages is shown schematically in Fig. 3. Fig 3: Schematic piezoelement design with five pairs of annular electrodes and corresponding driving voltages. The measurement of the acoustic field created by such a transducer was performed in a water tank in transmission mode using as a receiver the hydrophone VP-1093 Pinducer. The water tank had a rig that allowed motion of the hydrophone in three directions with 0.25mm accuracy. Measured directivity pattern in transmission mode (the experimental results in Fig. 3) was compared with theoretical curve a. Real pressure distribution on piezoelement surface within each ring only approximately recalls the theoretically desired pressure waveform. There is always some "cross-talk" between rings, that influences the performance. There was a pulse excitation in the experimental setup, but calculations were made for a monochromatic signal. Now we will consider the transducer near field synthesis problem, since in majority of cases in non-destructive testing and medical diagnostics, acoustic probes work in near zone only. Thus, we will determine the pressure distribution on the surface of a piston transducer needed to generate a specified near zone acoustic field. Mathematically, it means we should solve integral equation (1) for unknown pressure distributionon P(r) on piston transmitter surface by specified acoustic pressure field P(r,z) in near zone. Using this method, the near zone acoustic field of an annular transmitter can be obtained by subtracting the results for two disks of different radii. We applied this method to compute the acoustic field of our transducer with five pairs of ring electrodes. To do this we represented the transmitter as a set of rings driven by voltages with opposite polarities and various amplitudes. Then we applied the optimization procedure – i.e. found the amplitudes driving each ring transmitter, at which the created near zone acoustic field will represent a narrow weakly diverging ultrasonic beam. where each factor Qi is our old criterion (6), this time applied to the radial pressure profile at various z values, rather than the directivity pattern. The product M obtained for a specified depth range (say, for fifteen pressure profiles within the range from 10mm to 150mm) characterizes ultrasonic beam narrowness and divergence in this range. For our transducer, we computed the electrode sizes and amplitudes driving different rings and maximizing the criterion M. Note again, that the greater the number of rings on piston radiator surface, the narrower the acoustic beam obtained. We computed the acoustic field for a transducer with five rings (Fig. 4) in pulse-echo mode. Fig 4: Calculated acoustic field distribution in near zone in pulse-echo mode for disk transmitter consisting of five annuli. Transducer diameter 20mm, frequency 5MHz. The experimental study of the near field synthesis transducer was performed by using a piezoelement (frequency5 MHz, diameter 20mm) with five ring electrode pairs, made as described above. To transmit and receive signals in pulse-echo mode we used the same instrument UT-340 and the corresponding capacitor divider in order to get for each electrode pair the appropriate optimum excitation amplitude calculated for the near zone. The transducers with ring electrodes were made in a standard metal case with small capacitor dividers inside the case. Matching protector layer (wear plate) covered the piezoelement on the front surface, and a standard BNC connector was attached to back of the case. Generically, these probes look exactly like ordinary transducers and can be connected to any commercial ultrasonic flaw detector. Fig 5a: Axial-radial cross-section of acoustic field for transducer with five ring electrodes and oscillating pressure distribution on the surface. Transducer diameter 20mm, frequency 5MHz. Fig 5b: Measured amplitudes of the reflected ultrasonic signals in pulse-echo mode for transducer with five ring electrodes and oscillating pressure distribution on the surface. Transducer diameter 20mm, frequency 5MHz. All experiments were performed in a water tank with a 1.5mm diameter ball reflector. Figs. 5a and 5b (acoustic beam axial-radial cross-section and the PE response amplitude measurements) show that transducer with an oscillating pressure on its surface, where the amplitude of each "half-cycle" equals the value optimized for the near zone, does create a narrow weakly diverging ultrasonic beam in near zone. To simplify comparison between measurements and calculations shown in Fig. 4, the experimental results in Fig. 5b, as well as other measurement data shown below for response distribution, are presented in the same format as theoretical results. The technique based on formula (7) is valid only for disk and ring transmitters with constant pressure distribution on the surface. Real pressure distribution on piezoelement surface within each ring is not constant and only approximately recalls the "half-cycle". The "cross-talk" always existing between different rings influences the performance. These probes can be used as both immersion and contact transducers, since they have a flat front surface. At the same time, they have a stretched focal zone – i.e. provide focusing within a large axial range forming a "needle-like" axi-symmetric ultrasonic beam. Using a rectangular piezoelement and a system of linear electrodes on its both surfaces, a transducer creating a "knife-like" ultrasonic beam (narrow and weakly diverging in one direction but wide and uniform in the other direction) can be made. We now turn to the lens synthesis problem. On one hand, any lens gives worse results than a piston piezotransducer with oscillating pressure distribution on the surface, optimized as described above (due to various distortions, reflections, wave mode conversions, multiple reverberations, etc.). On the other hand, a lens is, probably, the simplest and cheapest part that allows energetically efficient beam focussing or collimating in any standard piston piezoelement. It is mostly for this reason that different lenses forming relatively narrow and weakly diverging ultrasonic beams have been studied and developed in recent years [1-3, 6, 9, 21, 22]. We will analyze the most promising lenses: axicon and lens with so called "logarithmic" profile. To calculate the shape of an axi-symmetric lens forming the specified acoustic field, we used the near field synthesis method – i.e. approach based on formulae (7)-(8), since any lens works only in a transducer near zone. In order to simplify the problem, reduce it to the previous one and avoid integration by curvilinear lens surface, we applied ray (geometrical) acoustics and projected pressure profile (distributed on the lens curvilinear surface) on the imaginary flat plane located close to this surface. Using formula (9) and near field synthesis technique described above and based on (7)-(8), we computed thickness profile h(r) , i.e. optimum shape of lens maximizing criterion (8) and forming a narrow weakly diverging ultrasonic beam within specified axial range. Another, more simple theoretical approach was also used for lens shape calculation. This method is based on geometrical acoustics and assumes that lens areas with different radial coordinates focus acoustic beam in the points with different axial coordinates. Both approaches gave identical results. The optimum shape of the lens and near zone acoustic field in pulse-echo mode created by this lens are shown in Fig. 6. This lens has a logarithmic-like profile and it forms rather narrow and weakly diverging ultrasonic beam. 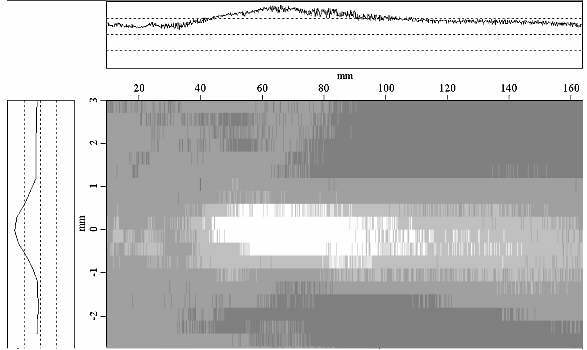 However the results are slightly worse than acoustic field shown in Fig. 4, particularly for small distances. Fig 6: Lens with optimized “logarithmic” profile (a) and calculated acoustic field in pulse-echo mode in the near zone (b). Transducer frequency 5MHz, lens diameter 20mm. Clens = 2.4mm/ms. The lens was attached to standard piezoelectric probe (frequency 5MHz, diameter 20mm) and tested in water-tank with the ball-reflector in pulse-echo mode. 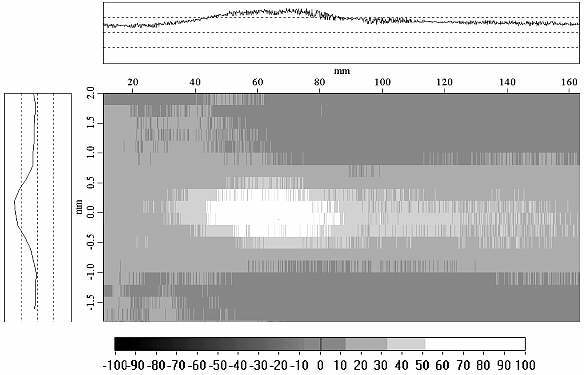 The obtained acoustic field distributions in the near zone are shown in Figs. 7a and b. Fig 7b: Figure 7b. Measured amplitudes of the reflected ultrasonic signals in pulse-echo mode for "logarithmic" lens. Transducer frequency 5MHz, lens diameter 20mm. The first theoretical approach, based on formulae (7)-(9), is valid only for annular transmitters with a constant pressure distribution on the surface. The second theoretical approach (geometrical acoustics) does not take the diffraction effects into consideration. Various distortions, mode conversions between longitudinal and shear waves, and multiple reverberations in lens lead to performance degradation. The acoustic beam created by a "logarithmic" lens (Fig. 7) is wider and more diverging than the beam formed in the near zone by transducer with an oscillating pressure distribution on the surface (Fig. 5). To compare the acoustic field in Fig. 7, created by a "logarithmic" lens shown in Fig. 6a, with an acoustic field formed by axicon (a well-known lens shape), we calculated and then designed and machined from a polyethylene rod the axicon lens with an optimized cone angle 850 (see Fig. 8a). This axicon was attached to a standard piezoelectric probe (frequency 5MHz, diameter 20mm) and tested in water-tank in pulse-echo mode. The obtained acoustic field distributions in near zone are shown in Fig. 8b. As one can see, this field is wider and more diverging than the acoustic field formed by the "logarithmic" lens, shown in Fig. 7b. Fig 8: Optimized axicon lens (a) and measured amplitudes of the reflected ultrasonic signals in pulse-echo mode (b). Transducer frequency 5MHz, lens diameter 20mm. Coming back to "logarithmic" lens, emphasize the following. If the "logarithmic" surface of the lens is attached to piezoelement, then its front surface is flat; and in such a case the probe can be used as both an immersion and a contact transducer. At the same time, this transducer has a stretched focal zone, providing focusing within a large axial range. We used a contact transducer (frequency 15MHz and diameter 6.35mm) with a removable 9mm long polyethylene delay line and machined the "logarithmic" lens on the inner surface of the delay line. The cavity between the lens and probe’s flat surface was filled by oil. This transducer forms a narrow weakly diverging ultrasonic beam and easily detects 0.3mm diameter pits located in a steel plate at depths from 1mm to 20mm. A transducer with cylindrically focused "logarithmic" lens will create a "knife-like" ultrasonic beam: narrow and weakly diverging in one direction but wide and uniform in the other direction. The transducer synthesis problem for far zone directivity pattern can be solved in general form using equations (4)-(5). From these, one can calculate the pressure distribution on the surface of piston piezoelement that generates the desired directional function. This method was applied to develop piezotransducer creating a narrow weakly diverging ultrasonic beam. It was determined that piston transmitter with an oscillating pressure distribution on its surface forms acoustic field with a narrow main lobe and small side lobes in the directivity pattern. A numerical computation algorithm was developed for calculating optimum parameters of this distribution. This method of acoustic beam forming was used to design and manufacture a piezotransducer capable of creating a narrow weakly diverging axi-symmetric ultrasonic beam ("needle-like" beam). A piezo-disk with a system of annular electrodes on both surfaces was designed, manufactured and tested. The desired pressure distribution was realized by driving various electrodes by voltages with alternative polarities and different amplitudes through capacitor dividers. Experimental testing of the transducer demonstrated that piston transmitter with an oscillating pressure distribution on the surface forms acoustic field with a narrow main lobe and small side lobes in the directivity pattern. Numerical modeling results for the acoustic fields are in good agreement with the experimental data, thus confirming the validity of the general approach. The near zone synthesis problem for piston transmitterr was solved. Parameters of pressure distribution on the surface of transducer, which forms a narrow weakly diverging axi-symmetric "needle-like" ultrasonic beam in the near zone, were optimized and computed. A transducer creating such a beam was manufactured and tested. Experimental data confirm the initial assumptions, method and accuracy of calculations. Transducers with ring electrodes look exactly like ordinary probes and can be used with any commercial ultrasonic flaw-detector. They have a flat front surface and can work as both immersion and contact probes, focusing ultrasonic beam within a large axial range. Using a rectangular piezoelement with a system of linear electrodes, a transducer creating a "knife-like" ultrasonic beam (narrow and weakly diverging in one direction but wide and uniform in other direction) can be made. The lens synthesis problem was developed and solved, enabling the determination of the lens surface profile forming the desired acoustic field. This method was applied to a lens creating a narrow weakly diverging axi-symmetric ultrasonic beam in the near zone. Shapes of two lenses forming such an acoustic field were computed: logarithmic lens and axicon. Lenses with these profiles were designed, made and tested. The measurement data match the computations and thus confirm the theoretical approach and calculation method. The acoustic field created by axicon is wider and more diverging than the field formed by the "logarithmic" lens which, in turn, is wider and more diverging than field, created by piezoelements with an oscillating pressure distribution on the surface. However, the lenses are much simpler and more energetically efficient. If the "logarithmic" surface of the lens is attached to a piezoelement, then its front surface is flat; and in this case, the probe can be used as both an immersion and a contact transducer. At the same time, this transducer has a stretched focal zone, providing focusing within a large axial range. A transducer with a cylindrically focused "logarithmic" lens will create a "knife-like" ultrasonic beam: narrow and weakly diverging in one direction but wide and uniform in the other direction. Y. A. Kondratiev and A. E. Karpelson, "Formation of narrow slightly diverging ultrasonic beams", Soviet Journal of Nondestructive Testing, vol. 10, pp. 938-943, Oct. 1978. R. V. Murphy, "Toroidal, conical and spherical lenses in ultrasonic inspection", Materials Evaluation, vol. 39, No. 4, pp. 391-395, Mar. 1981. M. S. Patterson and F. S. Foster, "Acoustic fields of conical radiators", IEEE Trans. Sonics Ultrason., vol. SU-29, pp. 83-92, Mar. 1982. W. Sachse and N. N. Hsu, "Ultrasonic transducers for materials testing and their characterization", in Physical Acoustics, vol. XIV, ed. by W. P. Mason. Academic Press, NY, 1979, chapt. 4. D. De Vadder and A. Lhemery, "A new ultrasonic transducer combining three modes", Review of Progress in QNDE, vol. 15, pp. 979-986, 1996. T. Tarnoczy, "Sound focussing lenses and waveguides", Ultrasonics, vol. 3, pp. 115- 127, July 1965. D. K. Hsu, F. J. Margetan and D. O. Thompson, "Bessel beam ultrasonic transducer: fabrication method and experimental results", Appl. Phys. Lett., vol. 55, N0. 20, pp. 2066-2068, Nov. 1989. J-Y. Lu and J. F. Greenleaf, "Ultrasonic non-diffracting transducer for medical imaging", ", IEEE Trans. Ultrason., Ferroelect., Frec. Contr., vol. 37, pp. 438-447, Sep. 1990. J-Y. Lu, H. Zou and J. F. Greenleaf, "Biomedical ultrasound beam forming", Ultrasound in Med. & Biol., vol. 20, No. 5, pp. 403-428, May 1994. J-Y. Lu, "2D and 3D high frame rate imaging with limited diffraction beams", IEEE Trans. Ultrason., Ferroelect., Frec. Contr., vol. 44, pp. 839-856, Jul. 1997. A. E. Karpelson, "Ultrasonic piezo-electric transducer forming a specified directivity pattern", Sov. J. of Nondest. Test., vol. 7, pp. 496-504, Jul. 1988. A. E. Karpelson, "Formation of beams of longitudinal and transverse ultrasound waves with the specified directional diagram", Sov. J. of Nondest. Test, vol. 2, pp. 120-126, Feb. 1989. A. E. Karpelson, "Desigh of a rectangular piezo-electric transducer according to a given directivity pattern", Sov. J. of Nondest. Test, vol. 4, pp. 246-253, Apr. 1989. A. E. Karpelson, E. A. Gusev, E. M. Kutin, T. M. Reshetnikova, "Ultrasonic piezo- electric transducers with improved frontal resolution", Sov. J. of Nondest. Test, vol.8, pp. 551-557, Aug. 1990. R. S. Elliot, Antenna theory and design. Englewood Cliffs, NJ: Prentice Hall, 1981, ch. 6. E. Skudrzyk, The foundations of acoustics. New York: Springer-Verlag, 1971, ch. 23. I. Malecki, Physical Foundations of Technical Acoustics. Oxford: Pergamon Press, 1969, ch. 5. A. E. Karpelson, "Possibilities of forming narrow weakly diverging ultrasonic beams", Sov. J. of Nondest. Test, vol. 5, pp. 436-444, May. 1988. A. E. Karpelson, "Creation of narrow weakly diverging ultrasonic beams", Sov. J. of Nondest. Test, vol. 6, pp. 517-523, Jun. 1988. J. A. Archer-Hall and D. Gee, "A single integral computer method for axi-symmetric transducers with various boundary conditions", NDT International, vol. 13, pp. 95-101, Jun. 1980. Y. A. Kondratiev, "Formation of narrow weakly diverging ultrasonic beams by transducers with curvilinear surfaces", Sov. J. of Nondest. Test, vol. 11, pp. 834-842, Nov. 1986. S. Holm, "Bessel and conical beams and approximation with annular arrays", IEEE Trans. Ultrason., Ferroelect., Frec. Contr., vol. 45, pp. 712-717, May 1998.